Hi everyone, I'm on the Ann Butler Designs blog today using reinkers and foiled paper. 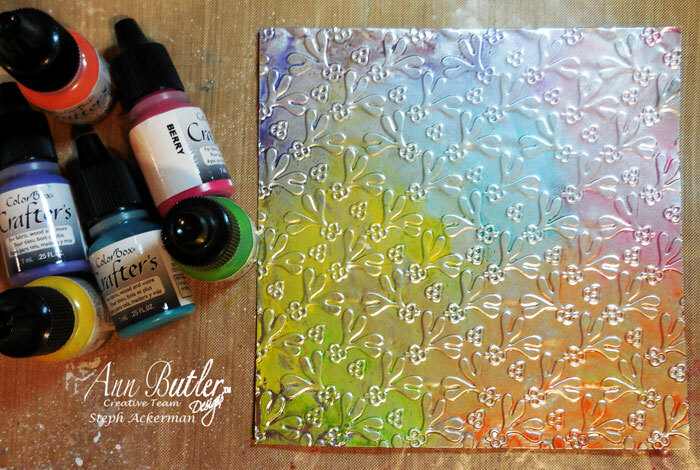 Using Rinea Silver/Silver Glossy Foiled Paper, I embossed it with an embossing folder. The foils take the embossing beautifully - so detailed! Once embossed, I used a paint brush to cover the panel with Ann Butler Crafter’s Ink (Reinkers) by Clearsnap: Berry, Aquamarine, Tangelo, Limelight, Sunshine, Lilac. I wasn't too careful since I had a plan! I used a baby wipe to blend and soften the colors. And the final result. Isn't it gorgeous? Looks like a metal sheet doesn't it? 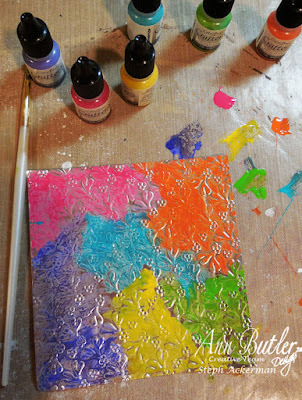 For complete details, please stop by the Ann Butler Designs blog.